BE sure to be listening for jingle bells in Gracemere this Sunday as the annual Santa's Lolly Drop kicks off. 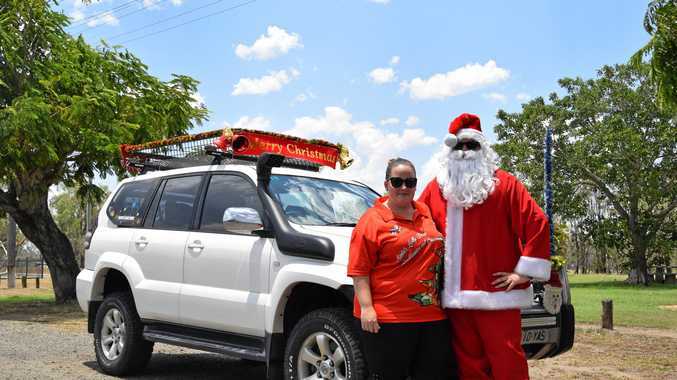 Santa will swap the Sleigh for his trusty Prado and will be gifting lollies to children around Rockhampton. The first lolly drop for the season will take place in Gracemere, but he will be visiting everywhere before Christmas. Organiser Tanya Watters, says that childhood memories of Yeppoon are the motivation for the lolly drop. "As a child in Yeppoon, they use to do it down there. So when I moved to rocky there was nothing like that up here - It gets pretty stagnant towards Christmas" she said. She hopes the lolly Drop will promote some Christmas hype around town. Over the years, Tanya and Santa have noticed more people roadside for the lolly drops, but they have plenty more lollies to deliver. "It has definitely been increasing - we've noticed a lot more interest" she said. The lolly drop delivered over 300kgs of lollies around Rockhampton last year. "Santa's got big, generous hands” Said Santa's spokesperson, Ashley Bourne. The large amount of treats used in previous years have prompted Tanya to seek lolly donations. Donations can be made at Cheese and biscuits café, Gorman's removals, Tasty Things café or Bluebirds United sports club. Donated lollies must be individually wrapped. "It's the smiles on the kids' faces when Santa come around is what makes it all worth it" Said Mr Bourne. If you want to know when Santa will be in your part of town you can like Santa's lolly drop on Facebook for more dates and locations.